We produce a full range of flat thread rolling dies in a wide variety of thread profiles for rolling all types of screws, bolts and fasteners. Also manufactured are rolling dies for many varieties of Lock bolts and rivets. These are produced to an accuracy that each die is interchangeable and can be set in a stack, off the machine and so optimising the best tool life and the machine running time. 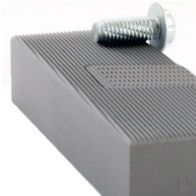 Dies can be manufactured for screws and fasteners from 1.1 to 32 mm diameter (0.043" to 1.1/4") with pitch from 0.32mm (>80TPI). Special form rolling dies can be designed and produced for your specialist applications and we have technical staff who can design and develop the product with our customers.